The screenplay for The Sun Also Rises was based on Ernest Hemingway's best-seller by the same name. It is set in the early 1920's, a few years after World War II. The movie is basically a character study of the "lost generation" of which Hemingway wrote. The central character is Jake Barnes (Tyrone Power). He is an American newspaper man, working in Paris, stuggling with psychological problems caused by war injuries which rendered him impotent. 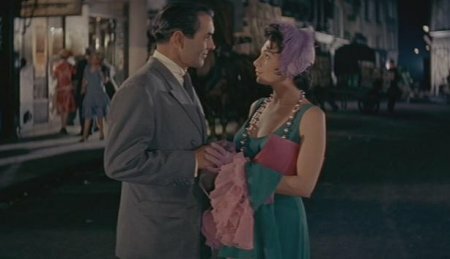 He hints at his problem to "his date", Georgette (Juliette Gréco), in the beginning scenes of the story, and a flashback explains further what happened to him. Jake is able to keep working, but it is apparent that his physical and psychological problems cause him to wander aimlessly about the city, visiting bar after bar and drinking heavily. Early on, we meet his friends, who join him in these wanderings. Lady Brett Ashley (Ava Gardner), is the nurse who took care of Jake at the hospital in Italy following his war injury. We see her in a flashback, where she is taking care of him as he is ready to go into surgery. During the flashback, we learn that she had lost her husband during the war. While she is taking care of Jake, they fall in love. Sadly, though, Lady Brett is not able to commit to just one man, and they go their separate ways. Like Jake and his friends who wander from bar to bar, she wanders from man to man. Every now and then, she professes to love only Jake, and she suggests regret that they didn't stay together. Robert Cohn (Mel Ferrer), is the only Jewish member of the group, as well as the only non-veteran among the men. He is a writer, from a wealthy family, who took up boxing while attending Princeton. He is having difficulties with his longterm relationship with Frances, and is ready to call it quits. When he sees Lady Brett for the first time, he proclaims her the most beautiful woman he has ever seen. He pursues her in boorish, awkward manner, eventually bordering on stalking her. She soundly rejects him. An insecure person, he doesn't take rejection well. He feels like an outsider and claims that Jake Barnes is his only friend. Bill Gorton, (Eddie Albert), is a heavy drinking war veteran, too. Bill and Jake are very good friends, each gaining strength through mutual support. Bill deals with the psychological problems caused by the war experiences with humor. He's a good guy who tries to get along with everyone and attempts to smooth over conflicts among his friends. Mike Campbell (Errol Flynn), is an aristrocrat, to whom Lady Brett is engaged. He, too, is a hard-drinking veteran, suffering from the aftermath of the war. To compound his problems, he has fallen heavily into debt. He and Robert are in constant conflict, caused by Robert's interest in Lady Brett.